Hello and welcome to my first in a series of articles offering my top ten tips and tricks for improving your photography of different species. These posts will not only include my favourite tips and tricks for achieving better and more creative images of specific species but also how to photograph responsibly so as not to disturb/destroy the subjects and their habitats. It seems appropriate that I start off with snowdrops as they are the first flower of the year that we see and one of my favourites. Over the last few years I have spent hours, days and weeks just working with these beautiful flowers always looking for new ideas and perspectives. For a simple little flower there are so many options from single flowers to a whole patch so here goes with some tips, ideas and of course plenty of photos to inspire you. 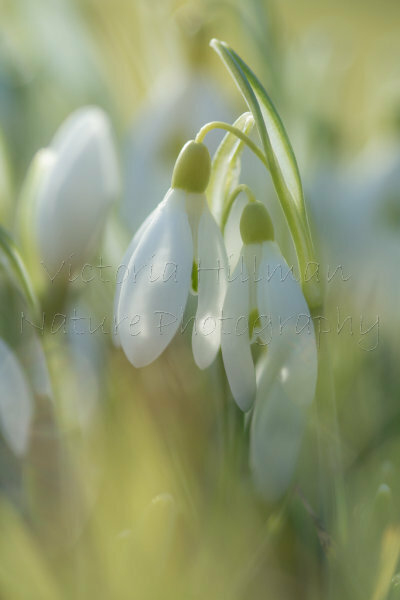 So lets get started, I just want to quickly add that all the photos you see here are all shot using only natural light and I use several of the different tips together to create my snowdrop images. Although I do carry out post processing it is minimal and just to further enhance the image and really bring out the image I have in my head. 1 - The most important tip, get low down as low as you possibly can and if possible right to eye level or below with the flower. By getting low down you can achieve some wonderful perspectives and insight into their little world. Please be careful when you are getting low down that you don't destroy the habitat or any flowers, take your time and find a spot that will allow you to get the low perspective without causing any disturbance. 2 - Plan to photograph them through their stages of growth, from when the flower buds start appearing through to the flowers being fully open in all their beauty. This way you have the chance to tell a story through the images. 3 - Think carefully about your lighting, I always use only natural light and this can be harsh or soft depending on the cloud cover, both of which have their advantages. Using a harsh low light to back light your snowdrop produces a very striking image (for example the first image) whereas a softer diffused light can be used to create a more dreamy effect (for example the second image). 4 - Try using black and white. On a bright, sunny day snowdrops really lend themselves to high contrast black and white photography as the white flower really stands out against the background. 5 - Use a wide aperture to throw out the foreground to create a soft blur to the bottom of your image and create a soft backdrop, producing a beautiful complete image. 6 - If you're photographing in an area where there is a good covering of snowdrops, have a think about using snowdrops in the distance to create the background. 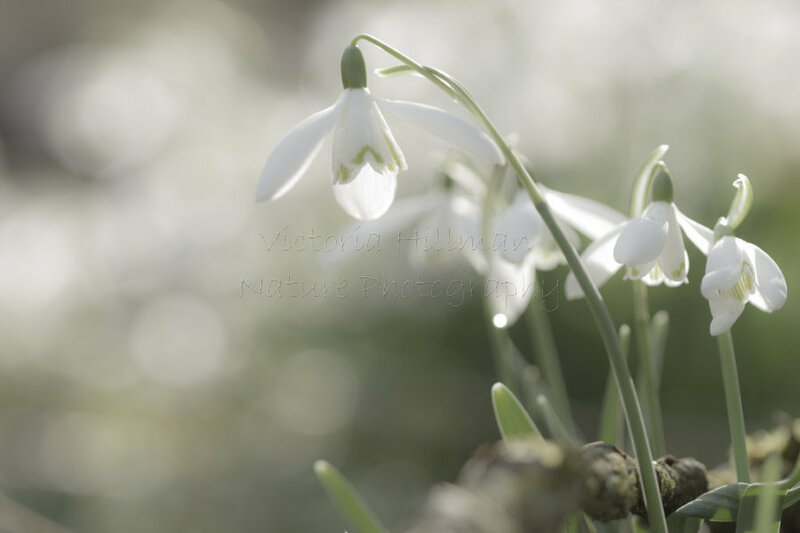 In this image I've use a wide aperture to produce bokeh using a clump of snowdrops in the background to create a wonderful soft backdrop to my much smaller clump of snowdrops in the foreground. 7 - Embrace the showers. It's going to rain at some point, we do live in the UK after-all, so embrace the showers and rain, it is surprising how much of a difference some water droplets can make to the image. 8 - Composition. The one thing about bulbous plants like snowdrops (this includes bluebells and there will be a post later in the year for my top ten tips for photographing them) is that they normally grow in groups offering so many opportunities to be creative with your composition, in fact it can be a lot harder to find a single flower on its own. 9 - Try something new and have a play with filters, a couple of years ago I started to have a play with a 6-point star burst filter with some great results. Also think about changing the white balance for different effects and tones, over the last few months I have definitely been leaning more towards much softer slightly muted colours rather than bright, bold colours, but always staying true to the colours of my subjects. A daylight or auto white balance actually works very nicely with snowdrops rather than a cloudy white balance that with add much more warmth to the image. 10 - Don't just make one visit. I will spend hours, days and weeks just photographing the same snowdrops, sometimes I come away with nothing and other times I have an incredible day but you need to persevere and keeping working at it. Everyday will produce different weather conditions, light, wind and rain all of which will produce very different images so make several trips or if you're photographing snowdrops in your garden try different times of day, pop out just after a rain shower even give it a go shooting in windy conditions. Here is one last image that is slightly different as I've used the wind and the surroundings to create a more dreamy image. I hope you've found these tips helpful and good luck with trying some of them out! Please do remember to be very careful not to damage any flowers or surrounding habitat when you are photographing your snowdrops and never remove them. Places are limited to 6 people to allow everyone enough one-to-one time during the day. Lunch, tea, coffee and home-made cakes are all included in the price to keep you going. Everything that I teach in the workshops can be carried over to other aspects of photography, for example many of the techniques I use in my nature and wildlife photography I also use in my wedding photography so they are very versatile.